Have you ever had McDonald's coffee? When we go up to the lake we usually end up having coffee from McDonald's unless Patty is there to make us a pot (we're lazy). 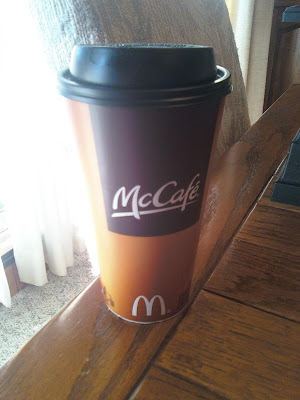 McDonald's actually has very good coffee, and its inexpensive. If you like coffee, check it out. My mother in law thinks its better than SBux. I agree if we're talking about plain coffee, but I'm still pulling for SBux with espresso drinks.